Does your budding musician need a toddler guitar? Children love music, and they love making music--- whether it is with singing, shouting, drums, harmonicas, or that cute guitar. What kind of guitar to you want to get your little boy or girl? You can get a wooden musical instrument; a ukulele or guitar that can really be practiced on, or you can get a plastic guitar toy that your child will jam away on in the playroom. A wooden guitar tends to be quieter and easier on the family’s nerves, and, of course, there is the educational benefit as well. A plastic guitar is nice because it is sturdy, is appropriate for even a thoughtless, wild toddler, and because your little guy or girl can get ‘exciting’ results right away, with no work. Which one meets your needs? 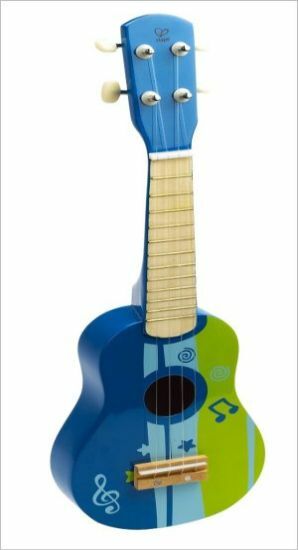 If you want a real instrument, you can get your toddler a Hape Early Melodies Ukulele, in blue or red. This is the bestseller in Amazon’s Kid’s Guitars and Strings, and there are plenty of reasons for that: it’s well-crafted, made of quality materials, and it’s a real musical instrument your child can really use. A small toddler may be just happy to carry it around, happy to have a guitar ‘like daddy’ or ‘like mommy’, but as he grows he can learn to play tunes as well: it is fully functional and can be tuned and played. 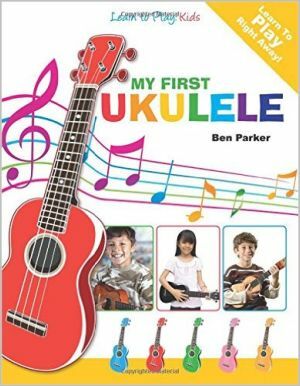 Get a book on how to play ukulele for children and give your toddler a few lessons. The second mode is for creative play, and when that is on each string will play a rock n’ roll ‘riff’. The guitar itself is toddler sized: 5 by 1.5 by 15 inches. It’s a translucent grey with red and blue LED lights inside. Another fun guitar for the playroom is Vtech’s Strum and Jam Kidi Musical Guitar Band. This play guitar is actually more than just a guitar: it’s meant to be an entire band, and can be folded to become a play piano or drum set as well. 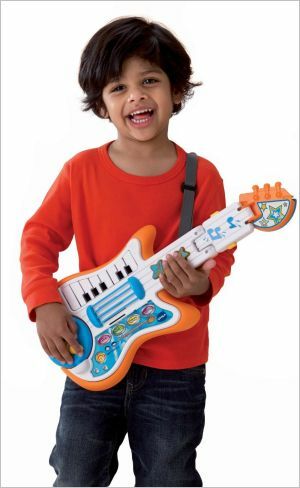 As a toy guitar, it plays hip hop, jazz, and rock. There are twelve included melodies, and a freestyle mode as well. Then there’s a removable guitar strap, which makes it easy for your little guy to carry his guitar around with him. 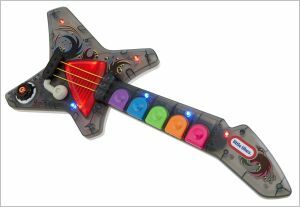 The VTech guitar may not be as cool looking as Little Tike’s PopTunes, and the strings are less convincing, but it certainly has a whole lot of functionality packed into a little plastic toy. It’s 20.4 inches long, 8.2 inches wide, and 2.7 inches thick. There you are: three very different toddler guitars. Make your choice well, because you’ll likely be listening to the melody your gift emits every daytime moment for a long time to come!